Biosun Ear Candles 10 pieces, with the newly developed, patented safety filter, drip washing is excluded for 100%. 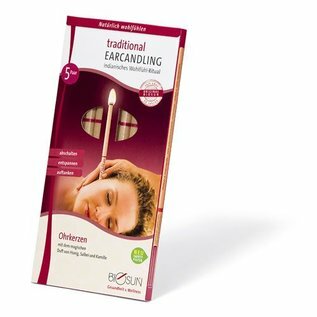 BIOSUN Ear Candles have been lovingly crafted since 1986 with templates from an old Indian recipe and have since been sold to more than 30 countries around the world. Their excellent reputation is due to the hitherto unattainable high production quality, of course the best used ingredients and not least the highest safety standard for ear candles in the world. 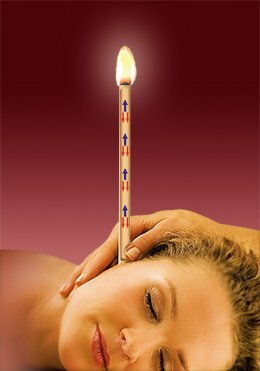 Earcandling incorporates the age-old Indian tradition of ear candling and combines them with modern approaches to aroma and music therapy. In a simple and natural way this ritual leads to a holistic relaxation for body, mind and soul. Feeling, smelling and hearing combine during the application on three senses and lead to a new dimension of experience. ✔ Only the best and naturally pesticide-free raw materials. ✔ Regularly checked by independent institutions. ✔ Quality management from production to sales. ✔ Paired hygienic packaging in environmentally friendly cellulose foil. Just like in the wellness center Earcandling uses the deep relaxing effect of the application with BIOSUN Ear Candles , matching scents and specially tuned music. This trend is also increasingly found in beauty salons, beauty salons, nail studios, hairdressing salons and pedicure studios. Whether in combination with existing treatments, for example facial massages, or as an independent treatment for deep relaxation. BIOSUN Ear Candles are about 22 cm long and the burning time per ear candle is 10 to 12 minutes. Ear candles are put into operation by ignition with fire. There is a risk of burns! Keep the ear candles out of the reach of children. For safety reasons, ear candles are not recommended for self-use. The application must always be carried out by a second person (such as a partner or partner). This makes the application safer and the relaxation experience can be experienced much more intensively. Always make a glass of water before the beginning to extinguish the remains of the ear candle! Create a relaxed atmosphere for use. With closed eyes you experience the ear candle experience many times more intense. The room must not be draughty and the flame must always be quiet. The effect of the ear candles is at its best in a comfortable side position. The head is supported by a pillow and the ear canal is almost vertically pointing upwards. During the combustion process small, cold ash particles can flow away in drafts in the room. To protect your hair and clothing, your partner can cover the area with a cloth as a precaution. As a result of the flame movement during burning, slight negative pressure (chimney effect) and biodynamic vibration waves occur in the indoor air column, resulting in a soft eardrum massage and physical pressure equalization. The heat stimulates the blood circulation and intensifies the lymph circulation. In addition, energy points and reflex zones are stimulated. This physical effect is often described subjectively as a soothing, pressure and analgesic feeling immediately after application, especially in the ear head area. Spontaneously it can also lead to freer nasal breathing and a better sense of smell, even with a previously filled nose. Light the Biosun Ear Candles on the unlabeled end and place them with the non-burning end perpendicular to your external ear canal. With gentle rotating movement and gentle pressure, until the ear candle is sealed on the side. The ear candle is correctly placed if there is no white vapor from the side and you can hear the crackling of the flame. Using the ear candle The ear candle is held by your partner throughout the application. The partner ensures that there are no hairs in the vicinity of the flame! At the latest, when the ear candle has burned to 1 cm above the rotating safety marking, the remainder must be carefully removed and extinguished in a glass of water. Quench the ear candle, it never goes out by itself! Always handle both ears, each ear with one ear candle. A further rest of about 15 to 30 minutes supports the overall experience extremely positively. Do you suffer from chronic or acute diseases, or are you not sure whether an ear candle application is possible for you? Then consult the therapist you trust. For perforated eardrum and implanted tympanostomy tube, use is generally not recommended. Always keep cool and dry. The Ear Candles from BIOSUN consist of a rolled unbleached cotton fabric, which is coated with beeswax and noble aroma essences. The new patented safety filter is located at the bottom of the approximately 22 cm long ear candle. 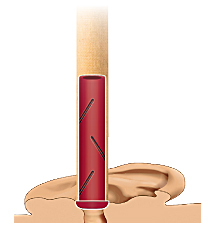 This end is placed on the ear canal, the colored safety mark on the circumference gives an indication of the termination of the treatment of the ear. With the newly developed, patented safety filter, drip washing is excluded for 100% by the overlapping slats. The open channel of the filter increases the effectiveness of the application. By rounding off the filter, the ear candle closes gently on the ear. Suitable for small and large ears. International patent rights of the new ear candlestick filter guarantee the exclusivity of the BIOSUN ear candling. BIOSUN EAR CANDLES at NATURAL BIO STORE !